Great cleaner for your carpets, dashboard, doors, console and more! The 303 Multi-Surface Cleaner is the concentrated version of the diluted and ready to use 303 Spot Cleaner. A premium all purpose cleaner for virtually ANY surface. 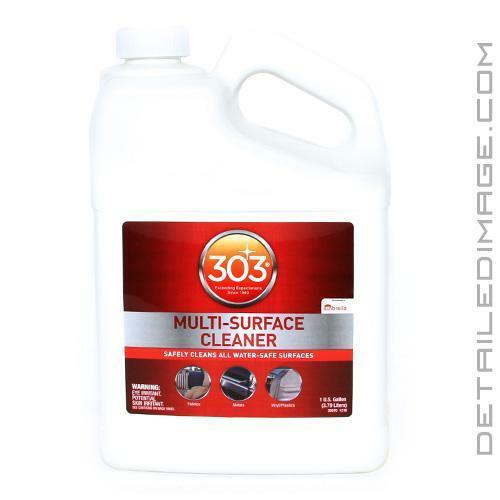 303 Multi-Surface Cleaner is safe to use on fabrics, vinyl, plastic, rubber and more, making it an extremely versatile product for your automobile, boat or home. You will love using it on your vehicle's dashboard, arm rests, doors, console, gauges, trim, buttons, vinyl and fabric convertible tops, carpets and fabrics. It safely removes stains, oils, grease, dirt, finger prints, residue and more so the surface is totally clean. For vinyl, rubber and leather surfaces this leaves the surface in ideal condition to apply your favorite protectant to prevent UV fading like the 303 Aerospace Protectant. Along with a firm bristle brush (ie DI Brushes Carpet Scrub Brush)the 303 Multi-Surface Cleaner is known to bring back beautiful shades of carpets not seen in years. Just spray any dirty areas or stains directly and work the bristle brush in different directions. This non-toxic and biodegradable cleaner releases the stain and build ups quickly and easily. After you're done using it on the carpet and fabrics use it all over the interior. Simply mist it on a DI Microfiber All Purpose Towel Blue and wipe the desired areas. It safely removes the dust, dirt and grime while leaving no residue behind. That is right no greasy residue at all! This excellent product has been around for years and was formerly known as the 303 Fabric & Vinyl Cleaner. It is an industrial concentrate so it can be used safely at full strength, yet still a highly effective, even diluted 30:1 (water:303). We recommend you use a 10:1 to a 6:1 ratio so you get gallons of cleaning solution out of just one 32 ounce bottle. You can dilute it inside of a DI Accessories Trigger Spray Bottle if desired. It works great in the vehicle, around the house, on boats, and tons of other places, cleaning up tough stains from coffee, soil, wine, sodas, fruit juices and many other organic compounds. Try this premium cleaner today and you will get excellent results with a great value. Safely brightens and rejuvenates surfaces & fabrics. 303 Multi-Surface Cleaner safely brightens & rejuvenates surfaces and fabrics by removing dirt, grease, oil, pet stains and much more. Safe for use on all water-safe materials including: textiles, canvas, upholstery, carpeting, apparel and vinyl. Wipe up stain excess cleaner with a damp cloth, rinsing out cloth in clean water as necessary. For heavier soils, increase agitation and soak time. Repeat if necessary. I use this to clean my vert top before treating w/ 303 Fabric Guard. I also use at 30:1 as an interior detailer. Leaves a great matte (flat) finish (303 Protectant is too shiny for the interior surfaces IMO). Also is a great spot cleaner if you get a stain on clothing, carpeting, etc. An excellent product that works! Cleans just about anything and works very well! Even works on carpet! Highly recommend this product. I used this product on the carpet and it did a good job of lifting up the stains on the carpet as well as cleaning it. I finished it off with High Tech Fabric Guard once it dried.